How can we engage communities? What is empowerment? To what extent should the project process be participatory? How is an outsider-insider relationship handled? How do researchers negotiate with the hegemony of western cultural interpretations? How are organizational and contextual influences handled in a project? What leadership demands do such projects place on researchers? What is capacity buil… ding? What are creative leaders and creative communities? How does the researcher journey from their studio to the situation? 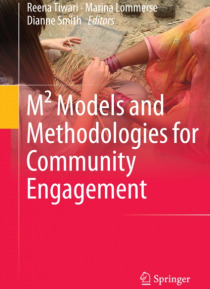 M2 Models and Methodologies for Community Engagement discusses key theoretical constructs - community engagement, capacity building, and community empowerment - in order to demonstrate how theory and practice are relevant to the development of forms of community involvement.The book maps the attributes of community based projects by moving beyond simply bringing people together from a variety of disciplines, and taking an approach which is transdisciplinary and applicable across cultures and genres. Here, all people - including the community - are ongoing contributors, and can freely move between their own and others' discipline-specific arenas.M2 differs from and extends on other works in this field of practice and research, in that its transdisciplinary, collaborative approach positions the community as a particular kind of discipline to create real change in diverse locations and fields of experience. The book is in itself a model of community engagement, as the researchers have formed a community of research and practice for change, and have developed a transformative model for community engagement that is greater than the sum of its parts - hence M2.M2 offers a valuable resource for students, researchers, academics, practitioners, policy developers and volunteers from the fields of architecture, interior architecture, health, planning, anthropology, education, home economics, communication, political studies and development studies.